I used to practice magic tricks with cards a lot when I was a kid. I wasn’t very good at it, but I could do a few. Double-flipping, “stories,” rigged decks. It was fun trying to trick my family members, seeing their bewildered faces as I did something seemingly impossible. Something that only magic could account for. 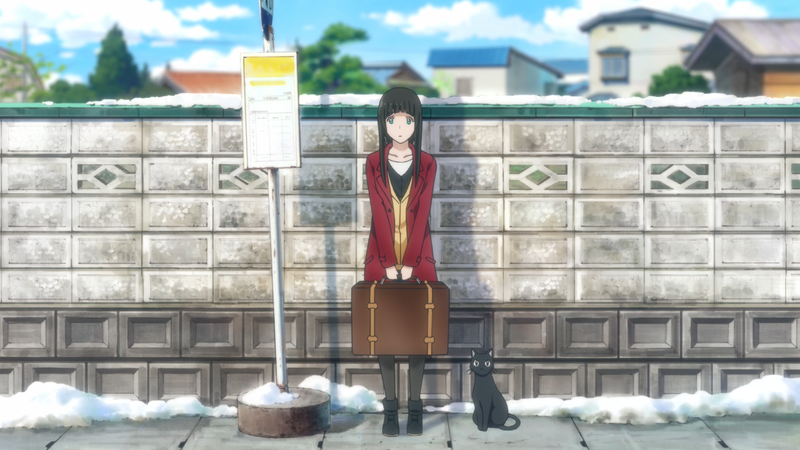 Flying Witch does not have card tricks, but it does have lots of magic – of a different kind. On one unassuming day in April, Makoto, a witch-in-training, arrives in a new town where her relatives live. Her purpose? To better her witch knowledge and abilities. Thankfully for her, the day to day happenings lend themselves to magical opportunities. And thus Flying Witch proceeds. This proceeding is nothing like work or routine. The anime is, after all, an “iyashikei” (or “healing”) show. Meaning, its contents are heavily designed to be easy, soulful, and happy in nature. And that is what the audience gets. Makoto hangs out with Chinatsu and Kei, Akane and Inukai, Nao and Anzu. She takes part in simple yet soothing activities, like finding herbs in a forest or pruning apple trees. 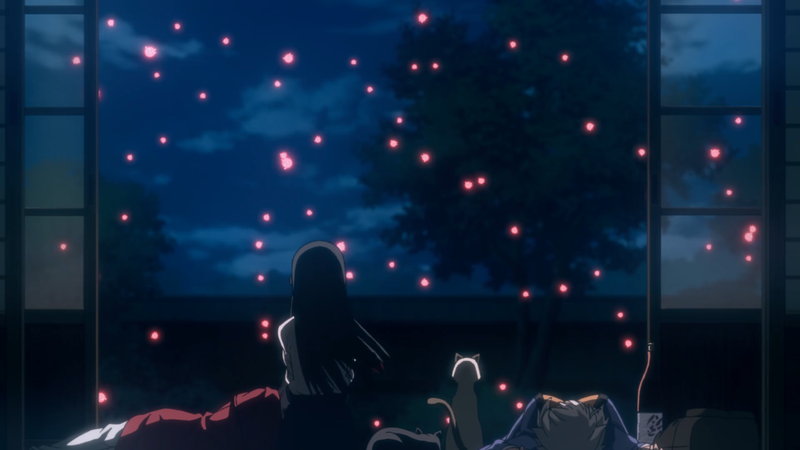 The setting also aides in Flying Witch’s healing capabilities. The small, quiet town is not boisterous with the clamoring of cars and bustling venues. Instead, it invites a feeling of nostalgia, a sense that this spot is tucked away from other parts of the world. Their home houses all the “action,” but its open doors, small farm, and simple décor create comfort with ease. Even the anime’s comedic moments are reserved. Nao says to Chito (Makoto’s black cat) that she seems to have gained weight, so she jumps on Nao’s back and lightly taps Nao’s forehead with her tail. The anime does not aim for huge laughs on purpose since that would defeat its healing agenda. Of course, one cannot forget about the magic, for it is implied in the title. And, unsurprisingly and surprisingly, magic ends up being the most important part of the show and the least important part of the show. First, magic being the most important. Throughout the season, the anime showcases many magical events. Summoning a murder of crows with Akane’s help. Turning Inukai from a dog-girl into a full-fledged dog. Revealing a ghostly waitress through Makoto’s drawn circle. It must be noted that these magics are not flashy whatsoever. While these are some of the more obvious moments, Makoto levitating or speaking with Chito are just as magical. No matter how normal the anime (rightly) depicts them. Since these non-flashy magics coincide with the iyashikei tone of the show, they also bring about some of the best moments that the anime offers. Hiding cafés, flying whales, and glowing fish are not possible, but, precisely because they are magic within a non-magic world, they stand out as a wonder to behold. Second, magic being the least important. In many of the scenes, magic plays no role at all. Makoto, Chinatsu, and Kei get their picture taken by a kind old lady passing by. Nao does her best to cook food during their cooking class. Chito walks the same route two different times. Just as it was with the flashiness of the magic, it must be noted how mundane these events are. Picking radishes and making hotcakes aren’t life-altering events. But they demonstrate that life really is just that: a series of simple yet personable moments. For instance, it’s not the otherworldly people that visit the café; it’s the good luck that a pair of romantic ladybugs bring. It’s not that there are fish that swim in the ground; it’s the serendipitous glow of those fish in the nighttime sky. It’s not the giant flying whale; it’s the peaceful ruins of a civilization long since gone on its back. In other words, when the magic and non-magic are combined, the show’s main message reveals itself: The truly magical moments are the ones that have been “nearby” all along. The show does have small faults when it does not take advantage of some of its elements. The father gets sidelined hard, the Harbinger of Spring only shows up once (despite having a dancing part in the OP sequence), and Chinatsu’s whole witch apprenticeship (let alone Makoto’s own training) does not see a conclusion. Again, these are not deal-breakers, but they do stick out as odd narrative choices. Regardless, Flying Witch’s tone and its message carry it as far as any broom could. That is to say, pretty far. 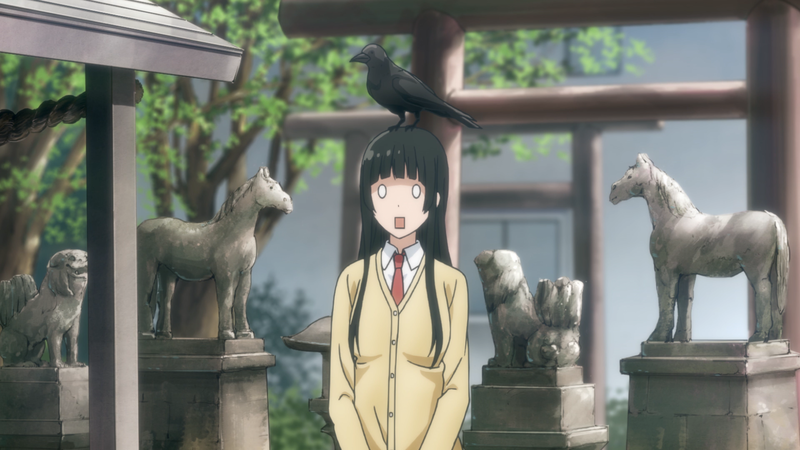 Flying Witch does not try to dazzle its audience, but what it provides is a lot of prettiness over the course of the season. Especially in its backgrounds. Dense forests, a quaint café, and a nighttime shot of some cherry trees are detailed in both lighting and depiction. Even more importantly, their soft colors and simplicity further evoke a feeling of calm. Perfect for this healing anime. In particular, the plants do the most work. Trees, flowers, bushes, herbs, and grass play a major part in making the show a peaceful, nature-filled hub. 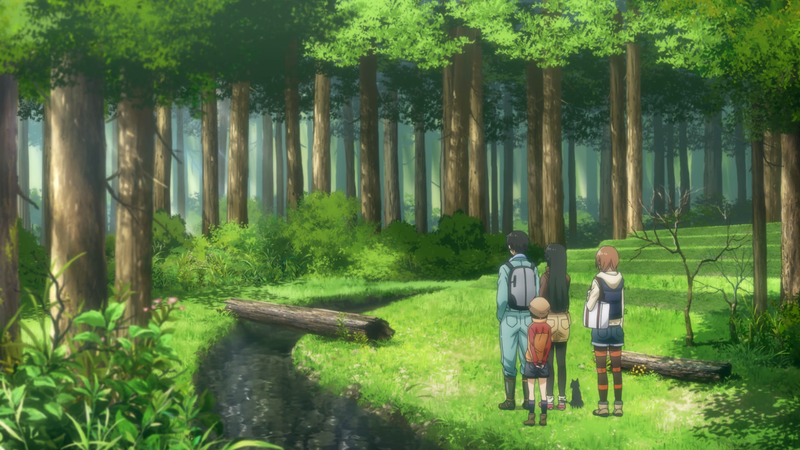 And since green is often associated with health and healing, the focus on greenery only furthers the anime’s goals. 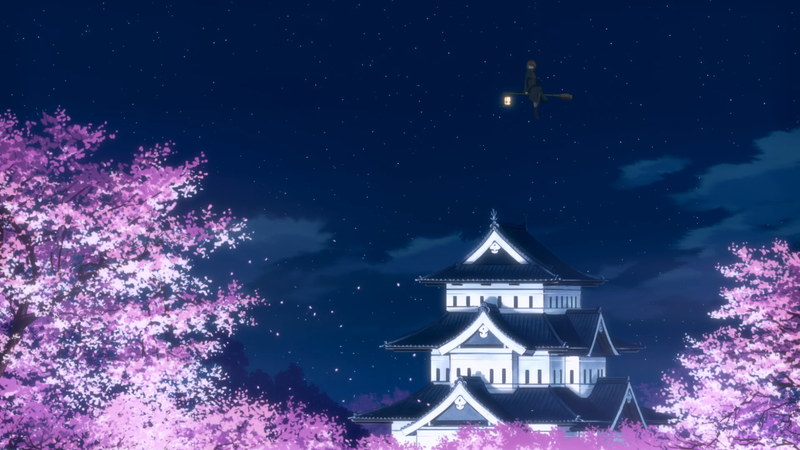 Even the town itself, with its roads, parks, and buildings, show off how pretty the anime can look. It’s a location revisited multiple times – much like Kei’s family’s house – but it never ceases to feel inviting to walk within. The character designs go for simplicity as well. And rightly so, for these characters are just that: simple, everyday people. Makoto’s long black hair, emerald eyes, and yellow cardigan simultaneously don’t stand out but make her the center of attention. Akane’s dark complexion contrasts with her white hair, giving her a foreign look. And Kei may as well be a background townsperson (in a good way) for how unassuming he dresses. Their various outfits, like Makoto’s pigtails and Chinatsu’s overalls, mix up how they usually look, adding even more strength to their designs. Of course, the more magical-looking designs deserve a mention. Inukai’s dog transformation, the Harbinger of Spring’s mask, and the paper man’s all-black attire. Indeed, their contrast with the normal, simplistic world Flying Witch presents makes their designs that much more intriguing. The show even employs reaction faces. They are subdued, often slight expressions of shock or bewilderment, bringing small moments of laughter yet keeping the show from going over the top in its delivery. The only real issue art-wise comes in the actual animation. The backgrounds and the designs receive the most attention, so the characters’ movement sadly does not. Most of the time, Makoto and the others are just sitting around the living-room table or chatting on a bus. Some more interesting segments exist, like when Makoto flies on her broom for the first time or when she’s chasing a pheasant, but these scenes are quite uncommon. Arguably, the unmoving nature of the characters fits Flying Witch. After all, less movement means more calm, and more calm means more peace, and more peace means more healing. Still, their lack of movement is noticeable, and it is enough to make the anime feel rigid rather than fun. With an anime like Flying Witch, it’s difficult to judge their characters in the traditional sense. The episodic format, the lighthearted, no-drama stories, and the lack of any character conflicts make Makoto and the other characters nothing more than themselves from start to finish. Not that that’s a bad thing. Because (again) with an anime like Flying Witch, it makes sense that the characters do not change. In fact, it’s almost thematic. Just as the story brings healing through showcasing the mundane parts of life, simplicity of character adds its own brand of healing: nostalgia, familiarity, and ease. Now, the problem with this approach is that it doesn’t leave the characters in what one would call a memorable light. Remember Kei’s design? His personality is just as dull. That’s not his fault; he’s simply being himself. He likes watching movies which makes him relatable, sure, but that does not make him a very interesting character. Same idea for Akane, Chinatsu, and even Makoto. The older sister drinks a lot, Chinatsu acts like a cute kid, and Makoto gets lost easily. But, because they lack so much on a character level (besides some niche traits like Makoto overproducing food or Chinatsu disliking bitter plants), they end up as little more than placeholders. Yet, that’s arguably the point. Kei reading a book in his room, Akane sleeping the afternoons away, and Makoto complaining about how the broom hurts her groin are not stellar character developments. But, much like the story and its portrayal of “magic,” these more simplistic aspects go right along with the show’s motif. That is, what makes them characters, makes them people, are not flashy occurrences but rather the everyday details that the audience can more than empathize with. If nothing else, the cast have their own roles to play when it comes to magic itself. One of the more obvious is Chinatsu. She’s a kid, so something like magic and what it can do has an even greater effect on her. As such, she embodies the wonder of magic. Akane is the most experienced and often hailed as a fantastic witch (by her own sister). Yet the magics she performs – creating animal-morphing chocolates, desaturating a landscape – show how much silliness and fun that magic can bring. So, she proves that magic does not have to be taken seriously. Makoto does not act like those folktale witches. She doesn’t have a crooked nose or green skin, and she doesn’t toil over a bubbling cauldron. (At least, not a big one.) Instead, she’s a sweet, kind girl who enjoys the outdoors, loves her family, and talks with her cat. In other words, she pushes back against the typical magic-user tropes – by being the complete opposite. Even Kei has his role. He’s a very quiet, very normal dude. He does not speak much let alone react to anything with more than mild amusement. In fact, the only time he seems to show any emotion is when spooky ghosts are involved. Thus, he demonstrates that magic is not something to be fearful of. Altogether, the characters are not the most impressive. However, they at least have these roles and a more thematic argument at hand, giving them a bit more strength than they otherwise had. Two pieces of music stand out from the others in Flying Witch: the opening track and the main track from the OST. The OP generates a lot of fun. The vocalist’s “Sha la la la…” followed by the quicker lyrics gets at that immediately with their shortness and silliness. The clapping in the background doesn’t just go along with the beat; it’s something that’s easy to clap to. And the guitar flourish, played near the beginning and right at the end, is a catchy little arrangement that starts and finalizes the track on a bunch of happy notes. “The main track” sounds vague, but it’s obvious which one it is. It starts with a simple acoustic guitar before gently wading into some light piano work. The piano itself jumps around in a calm manner – all while the guitar continues playing in the background. The beat the combo produces becomes a leitmotif that many of the other tracks use, getting at (once again) that familiarity and therefore healing feeling. The show does have other tracks, like those steeped in woodwind instruments or only relying on that acoustic guitar. They’re not as powerful as the leitmotif, but they have their own sense of simplicity that evoke similar feelings. On the lower end of the sound department are the ending track and a particular voice-acting job. The ED goes for a slower pace with both Makoto and Chinatsu singing individually and together. It’s a more reserved piece, aiming for a bittersweet tone that it mostly achieves. It takes a few listens to warm up to it, and it’s not necessarily a poorly composed piece. But with a loud middle section and a grander scale that does not mesh well with the rest of this laidback show, it does not hold up as well as the other tracks offered. I have a couple of favorite moments from the show. One of the first being the trick-and-treat episode. Watching Makoto cry at everything, Chinatsu laugh at everything, and then Chinatsu laughing at Makoto crying made for a hilarious scene. I also really liked when Akane mistook Nao to be Kei’s girlfriend. She started crawling on the ground, making encouraging sounds and gestures as she egged on Kei and left the room. Beyond these couple of scenes, though, I was merely content with the anime. Another way to put it, I neither hated nor loved it. A lot of that falls on the characters. They didn’t have much of a personality beyond just being nice to one another. Chinatsu could be silly, Akane could be lazy, and Inukai could be angry, but they were all a bit too plain. I understand that it must be this way. If everyone was shouting or had explosive personalities, they would not fit with the laidback atmosphere. And it’s not like they are unlikable characters. They are nice and happy and fun. I just would have preferred more out of them. Even so, Makoto was my favorite of the bunch. Her smile while holding that mandrake, her surprised face when a crow landed on her head, and her energy when in the forest made me very happy to see. Also, the paper man. He was a cool and ominous dude. Too bad he was only around for maybe twenty seconds tops. 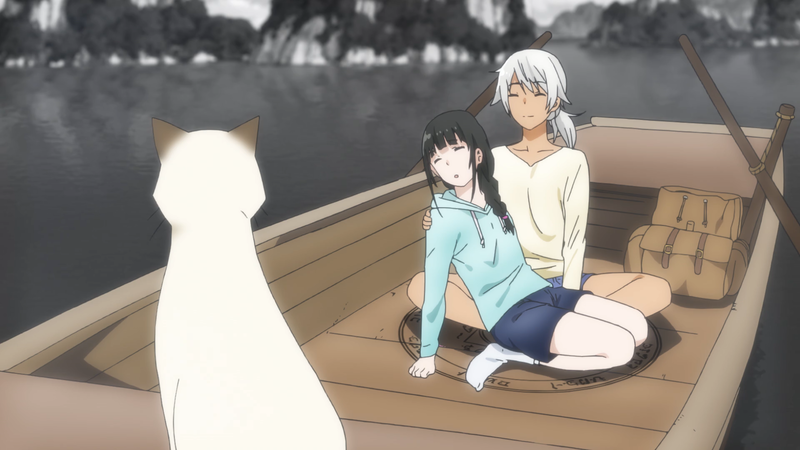 Flying Witch may not do a whole lot, but its heart is in the right place. The story’s message is meaningful, the art is pretty, and the characters serve specific roles. It’s a simple show – and that’s no card trick.